Finally after a long wait the first teaser poster/first look of the film Prem Ratan Dhan Payo is revealed. 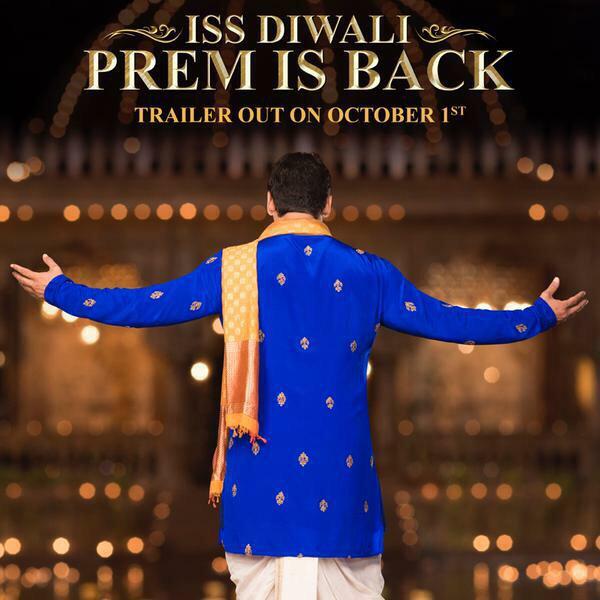 The poster features Salman in Royal dress with the title ISS Diwali Prem is Back. Also, the poster reveals that trailer of the film will be out on October 1st. See Also : Watch Prem Ratan Dhan Payo Trailer - It's Super Boring! So, the trailer is coming really soon, we hope Salman will release the trailer before the date because he is always surprising his fans by revealing the trailers earlier than committed date. See Also : Salman Khan is excited about a film, but It's not PRDP! Than which film is that? Salman Tweeted "Good afternoon. Welcoming Sooraj Barjatya's Prem again." The film has Bajrangi Bhaijaan actor in dual role and also features Sonam Kapoor, Neil Nitin Mukesh & Anupam Kher. Being directed by Sooraj Barjatya the film is produced by Rajshri Productions and has music of Himesh Reshamiya.